Why Does This Giant Electronics Company Care so Much About Dogs? If you've ever been to Crufts you'll have no doubt witnessed for yourself the giant commercial installations of the big pet industry brands. Whilst it is blatantly obvious why the likes of Pedigree, Pet Plan and Purina take a large trade space at the event , their interest is self explanatory – they make stuff for dog owners - but have you ever wondered why Samsung, a consumer electronics company, has such a noticeable presence at the event? In 2005, K9 Magazine wanted to find out more. You may own a Samsung product such as a mobile phone or a television, after all it’s electronics for which the company is famed – so just why does one of the world’s most famous companies want to make an impression on dog owners? “Samsung’s products and services are designed to improve the quality of people’s lives. Thanks to our visionary Chairman, who is a passionate dog lover, we believe that animals, but especially dogs, can significantly enhance the quality of our daily lives and positively enhance our emotional makeup. Events like Crufts is a chance for us to share this belief with UK dog lovers and show them just what Samsung is doing in Korea to bring people and dogs closer together. As John Kim mentions, Samsung’s involvement with dogs originated many years ago with the company’s Group Chairman, Mr Lee Kun-Hee. Head of the world’s fastest growing global brand (Interbrand, 2001) Mr Lee is a passionate animal lover. With a childhood surrounded by dogs and realising their tremendously positive impact on his formative years, Mr Lee became steadfast in his decision to show his fellow Koreans the value of dogs and their importance on our emotional makeup, just as they had impacted on him. 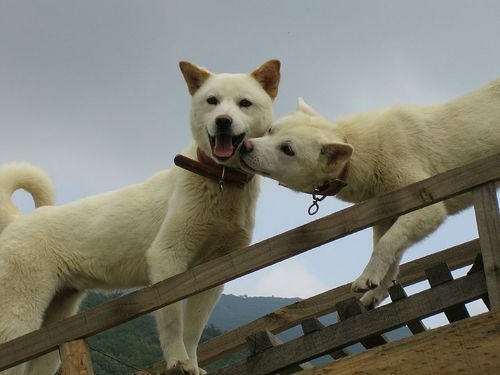 He wanted to establish programmes in Korea to help bridge the gap between people and animals – especially dogs – and educate the public by showing the long-term rewards of responsible pet ownership and the contribution of dogs on all parts of society. From one man’s passion, a new Samsung division – the Samsung Office of International Relations - was established over a decade ago, responsible for the running of unique programmes which would change the lives of many Korean people. On a wider scale, they would positively change the public regard for dogs for the better, so fulfilling the Samsung ambition to drive change and improve the quality of life. Over the years, staff from this new unit were regularly dispatched to the UK, which Samsung regarded as an epicentre for animal welfare, to learn about specific animal welfare initiatives from top UK organisations and individuals. These organizations included The Animal Health Trust, Guide Dogs for the Blind Association, PRODogs, the RSPCA and Dogs for the Disabled, Search and Rescue Dog Association (SARDA) English Lake District Branch and the West Midlands Police Dog Centre. As a result of these partnerships, Samsung was then able to establish its own similar programmes in Korea. As the UK has had such a heavyweight impact on the establishment of virtually all seven programmes, events like Crufts provide Samsung with a platform from where the company can update its British friends about the progress and the response to its work. Critically, the company’s special commitment to animal welfare is founded on a philosophy which is now an integral part of the company’s culture and is being warmly embraced by the Korean public. “People do question why we are involved with animal welfare and what originated from one man’s personal experience and passion, is now a shared feeling amongst Samsung staff in Korea and helping to change attitudes amongst the Korean public. We are proud that our programmes are a catalyst for change and are helping to nurture an animal loving culture. So much has happened in the past 10-15 years to the animal welfare landscape in Korea and whilst there is always more to be done, as a major player in Korea we are prepared to do our part. Whilst many companies support worthy causes with donations, our methodology is to lead by example, and so we have gone a step further than most by setting up a Samsung unit dedicated to our seven animal welfare programmes, which also includes kennel facilities and training centres. We have a regular traffic of overseas visitors, especially from the UK, who see our work in action and who provide ongoing assistance. Our approach to deliver change is subtle and to lead by example, not by condemnation or criticism.” And by all accounts the company’s approach is working. Crufts 2005 also saw the first UK appearance of the highly revered Jindo dog, the indigenous Korean breed which is protected by the Korean government and which carries the title of Korean ‘National Treasure’ (number 53), the highest honour given to precious artefacts, animals or people in Korea, on Samsung’s stand. Visitors were able to meet the Jindo first hand, learn about the breed, its heritage and characteristics, as well as Samsung’s efforts to protect and build awareness of the breed both in Korea and in the UK. So, if you do happen to be at a dog related event some time and find yourself wondering why a company famed for electronics has such a strong presence, now you know. It’s not to sell mobile phones, cameras or TV’s – here is a global giant, truly committed to helping man’s best friend in their homeland of Korea as well as spreading the message about dogs abilities to enhance people’s lives throughout the world.